Welcome to Data Analysis with Excel! Spreadsheets, especially Microsoft Excel, are an incredibly powerful and versatile tool. You can use them to settle accounts with your roommate, or to build a complex model to predict stock market returns. Excited to explore the magical world of data analysis with Microsoft Excel? In this course with 15-20 hours of hand-crafted content, you’ll play the role of a data analyst at a Fortune 500 company called SnackWorld (it’s fictional, but hey, you’ll be working with data about snacks!). By working on lifelike problems, you’ll not only become a master of Microsoft Excel, but also learn to think like a data analyst, and build skills to excel in your role! Springboard! We’re an online school that works with industry experts to teach skills like data analytics, data science and UX design. 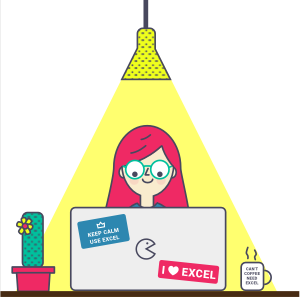 To build this online Excel course, we partnered with data analytics experts from top organizations, including Bain & Company, Capital One and Wharton, to help you learn Excel and data analytics the way they are used in the industry.. We are passionate about Data Analysis and want to help you become a spreadsheet superstar! Who is this online Excel course for? Beginners and intermediate Excel users, who are interested in pursuing an analytical career. People who want to understand how to apply Excel functions to Excel data. Why should you learn Excel? More than 1.2 billion people use Microsoft Excel worldwide! As one of the most popular software applications today, Excel has tons of real-world applications, such as predictive modeling, tracking sales and data visualization. In fact, only 0.5% of all data in the world has ever been analyzed! Data analysts turn numbers into insights. They process large data sets to arrive at data-driven recommendations for a company’s strategy or actions. They need to be able to explore data, process it, and be compelling communicators with it. Excel is one of the most popular tools in the field and it is the foundation of a career path with an average salary of about $60,000. What will you be able to do by the end of this course? Become an expert at common and advanced Excel formulas and tools -- from VLOOKUP to Pivot tables and more!